At first glance we thought these were pencil sharpeners, but this webcam concept by Nanjing OIOI Design still has more functionality than just shooting video. 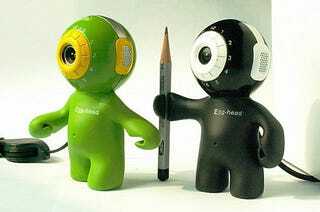 These odd designs also incorporate a clock around the lens, and have stubby little flexible arms that can hold a pencil, pen or message. Designed for the wee ones, we especially like the Superman design—check it out after the jump. Since webcams are becoming a dime a dozen these days, perhaps some manufacturer will pick up on these whimsical designs.